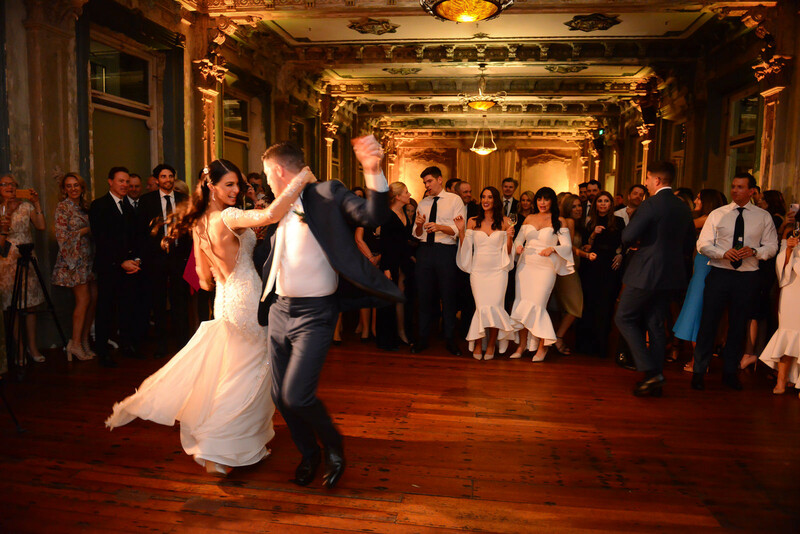 On the 17th of August 2018, Emily Simms and Pierre Ghougassian started their forever by tying the knot in Melbourne at the cities Town Hall before celebrating the night away at their gorgeous reception venue, The George Ballroom. We chatted to the lovely couple to find out all the exclusive and behind the scenes details of their big day! Now tell us, how did he propose?! Now for the wedding! How did you find the experience of planning a wedding? From where did you take your inspiration? The ceremony, tell us all about it! Where was it? How many guests were there? Did it involve anything unusual? “Our ceremony was on the balcony of the Melbourne Town Hall. I loved the columns, and I found it in keeping with the style of The George Ballroom. I really wanted everything to flow nicely. Did you follow any styling themes on the big day? What flowers did you decide to go for? Can you tell us about your photographer and his style? What was the music vibe? And the cake?! Tell us about it! Can you tell us about the fashions on the big day? What was everyone wearing?! What was the highlight of your big day? We’d love to hear about your honeymoon! Lastly, if you could give other couples any wedding advice what would it be?